Add style to all of your for window displays, counter tops, and table tops! With our Raw Steel Countertop Merchandise Hooks, you can showcase hand bags, scarves, and garment displays! Featuring an industrialized raw steel finish, these merchandise hooks add a stylish aesthetic element to your show room floor. 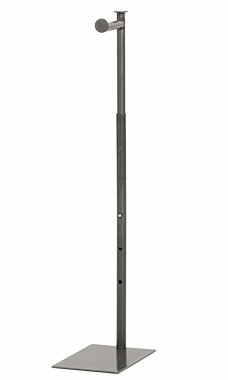 With an adjustable push button arm, the stand extends from 24" to 36" high and features a 6" hang rail with 5" of hang space. The merchandise hooks come standard with a flat cap, but 4 designer finials can be purchased separately to increase the visual appeal in your store!